Peter Rees, author of the highly successful book Lancaster Men, delivered a talk about his book tonight at the Shrine of Remembrance here in Melbourne.. Despite the shocking weather there was a good-sized audience of perhaps 100 people present, all of whom listened in some awe to a very thorough presentation which covered the main themes of the book and told some good stories. Peter made certain to mention that Lancaster Men was his publisher’s choice for a title, not his – there were, as he rightly points out, other aircraft flown by Australians in Bomber Command! He told some stories from ‘behind the scenes’ of researching and writing the book, like Ted Pickerd, a 463 Squadron veteran who who greatly assisted Peter’s research before he died last year. They would meet weekly at the Australian War Memorial to pore through documents and archives together, Ted still being in possession of his navigator’s eye for detail and accuracy coming to the fore. 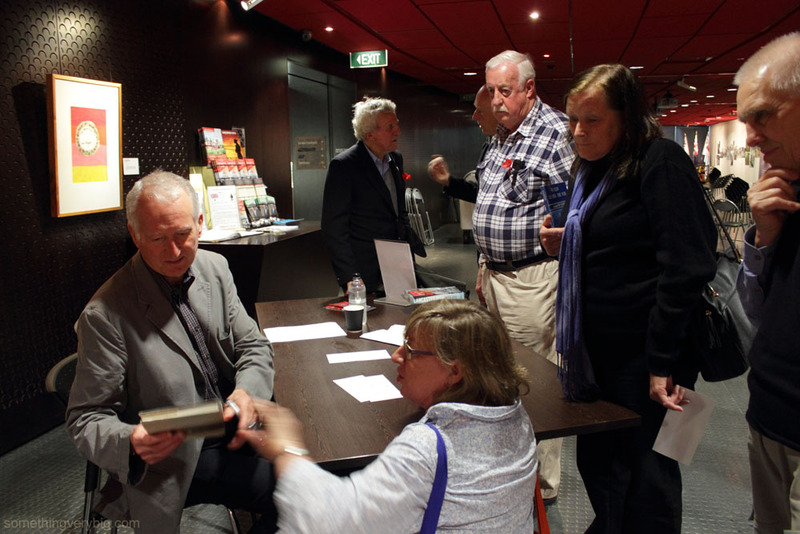 He also said that since publication the book has received strong support, so much so that it’s now on its third print run (and indeed the Shrine shop ran out of copies of the book tonight, like the Australian War Memorial did during the Bomber Command weekend in Canberra in June), and as a direct result of writing it he has received so many further stories from people who have read the book that he is planning a follow-up volume in a couple of years time. A lively discussion followed the talk, with Dresden getting much of the attention – and, incredibly, adding their input from the audience were four Bomber Command veterans, three of whom had in fact been on the Dresden trip and who could add recollections of what they were told at briefing for that raid. That added a very personal, and quite immediate, touch to the discussion at hand. Someone mistook me for an official photographer and asked me to organise a group photo of Peter with, yes, the Lancaster Men. Left to right, we have Len Swettnam (a bomb aimer), Gerald McPherson (rear gunner), Peter Rees (author), John Wyke (another rear gunner), and Gordon Laidlaw (pilot). Peter cites the lack of recognition given to Bomber Command and especially its returning veterans at the end of the war as one of the reasons he wrote his book. This event, of course, tied in with the Bomber Command exhibition which is now showing at the Shrine. And next week at the Shrine will be a panel discussion with, among others, Peter Isaacson, perhaps one of Australia’s most well-known Bomber Command airmen. It’s all evidence of the increase in awareness of Bomber Command in recent times. At least a little bit of the credit for that should go to Peter himself. His very readable book has made some of the extraordinary stories of the ordinary airmen of Bomber Command accessible to a mass audience. That can only be a good thing, if the stories are to live on. The Shrine has placed a podcast of Peter’s talk on their website. The download is here. 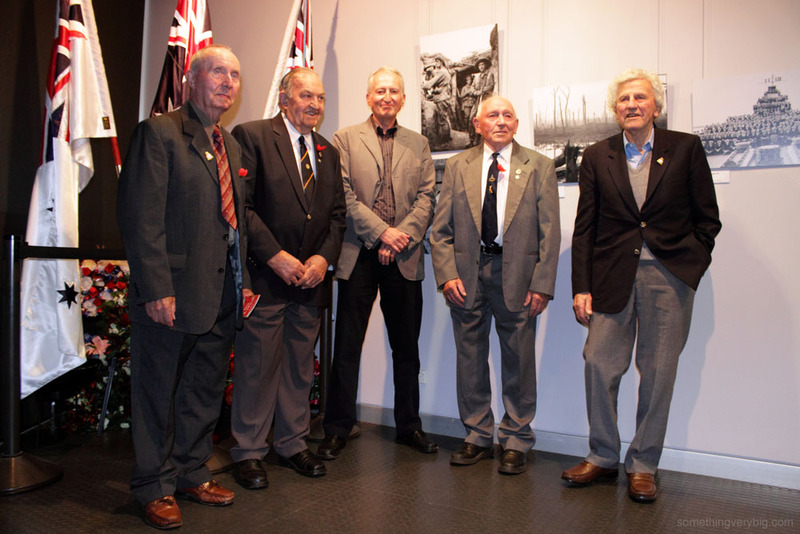 Published in April this year, Lancaster Men: The Aussie Heroes of Bomber Command is a new book by Australian journalist and author Peter Rees. It’s one of many books by Australian authors to be published on the subject over the last few years, and I think it’s one of the better ones. Inspired by the stories told to him by Kathie Pickerd, daughter of Ted, a 463 Squadron navigator and later one of Australia’s highest-ranking Air Force officers, Rees began interviewing a large number of Bomber Command veterans and came to realise, he says, “that history had treated them harshly. It was time for their stories to be told in their own words.” The book, then, does not claim to be a definitive account of Australia’s role in Bomber Command – the Official Histories take care of that. Instead, it’s based on personal accounts taken from interviews, transcripts and memoirs, both published and unpublished. The result is a more or less chronological account of the experiences of Australians in Bomber Command, from enlistment to operations and from the earliest bombing raids to Dresden and beyond, as seen by those who were there. Given the vast spread of the campaign, over time, over different units and over a large geographical area, this is an appropriate way to look at things, though the concentration on Australians sometimes omits the airmen of other nationalities who flew in the same crews. Rees’ journalistic talent is evident in his vivid descriptions and the book is well-written in an engaging style. The focus on the personal shows in the way that he tends to use first names for the main ‘storytellers’ throughout his book, and in some of the stories of off-duty life in wartime England, which arguably were as much a part of the experience of Australians in Bomber Command as the operational trips themselves. He also covers some interesting ground looking at life under the bombs – notably the effects of the 22 November 1943 raid to Berlin, which caused a tiger to escape from the zoo. The beast “made its way to the Café Josty, gobbled up a pastry and promptly [fell] down dead. […] Although nearly all the major hotels had been wrecked, the premier hotel of the Third Reich, the Adlon, survived relatively intact, but it had no heating and could muster up only cold cuts and potato salad.” (p.138) Stories like these add life to the history and are an important reminder that there were indeed people in those cities too. There is a good section putting D-Day in the context of the war in general, and Bomber Command’s operations in the context of that (Chapter 26 and on and particularly p.242-243), and a very interesting discussion of the politics between Australia and Britain when dealing with Australian bomber crews, as evidenced by a ‘manpower fiddle’ that left 463 and 467 Squadrons short of aircrew in April 1944, when the British wanted to avoid disadvantaging RAF squadrons after the Australians demanded tour-expired airmen be sent home to fly against the Japanese (p.181 and on). The only problem with Lancaster Men is that Rees is a journalist, not necessarily a historian. As a result historical rigour is not necessarily always present and he tends to take quotes directly from secondary sources without checking the original documents for accuracy. For example, he quotes the 467 Squadron Operational Record Book but cites another book (Dan Conway’s The Trenches in the Sky) as its source. He also takes figures for aircraft losses on the 10 May 1944 Lille raid directly from Rollo Kingsford-Smith’s memoirs without cross-checking with the ORBs… and so perpetuates the error that seven aircraft were lost on that trip from 463 and 467 Squadrons (it was only six – the mistake probably has its genesis in Nobby Blundell’s Squadron histories). He gets the figure right on a later page but the contradiction hasn’t raised any flags in the editing phase. Errors like these are an occupational hazard when dealing with personal accounts of history, particularly when those accounts were created upwards of seventy years after the events described, so it would have been nice to see a little more cross-referencing occurring. But otherwise Peter Rees has painted a vivid picture of life as an Australian in Bomber Command. Lancaster Men is well-written, engaging, shocking, exciting, funny and sad, and well worth a read. Lancaster Men (ISBN 9781741752076) is published by Allen & Unwin, and retails for AU$32.99. An interview with Peter Rees, as broadcast on Radio National on ANZAC Day 2013, is available for download here.